Imagine if universities were as accessible to the general public as community centres. Kids’ after-school activities would run alongside evening classes. Athletic fields would be used for charity yard sales. Members of marginalized groups would work alongside professors on research projects. Actually, some of this is already going on. Wilfrid Laurier University has in recent years put increasing focus on connecting the university and community. The university runs children’s summer camps, a variety of community research projects and many outreach events. Still, significantly more could be done, says Ginette Lafrenière, an associate professor at Laurier’s Faculty of Social Work in Kitchener. Lafrenière, who is director of both the university’s Social Innovation Research Group and Manulife Centre for Community Health Research, has dedicated her career to serving the community. She spent 21 years as a social worker and community organizer before earning a PhD and becoming a Laurier professor in 2002. Initially she felt like a “fish out of water” in academia, she says. But she soon learned that students didn’t want to learn about social work theoretically – they wanted to understand it in a tangible and political way. “When you are a student at the Faculty of Social Work, you are in essence a public intellectual, as such, you have a responsibility to be of service to the community." Lafrenière does have an active community-based research program, as do both the research centres she directs. She has received many grants and awards over the course of her academic career. However, “we do a lot that goes beyond simply research,” she says. That includes advocacy work, working directly with community partners to help them access funding, and even holding garage sales and other fundraisers for community groups. It’s an attitude Lafrenière tries to instil in her students. 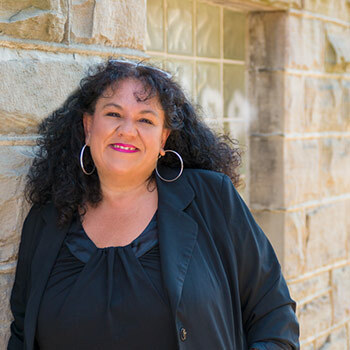 “When you are a student at the Faculty of Social Work, you are in essence a public intellectual, as such, you have a responsibility to be of service to the community,” she says. Much of Lafrenière’s research focuses on tangible outcomes to improve community health. She and her team have worked with more than 60 agencies in Ontario, including local health and social service organizations such as KW Counselling Services and the Sexual Assault Support Centre of Waterloo Region. Lafrenière and her team have produced a series of videos in partnership with a local chiropractor to help teachers execute exercises with their students, spearheaded a program to get star athletes to talk to students about the dangers of performance-enhancing drugs, evaluated the success of the local Breastfeeding Buddies program at the Kitchener Downtown Community Health Centre, and produced a breastfeeding documentary called Weaving our Common Threads. That’s just a sampling. There have been so many collaborative community projects that Lafrenière has trouble remembering them all. There are plenty more at other universities. That’s why she’d like her next project to be a research body – what she calls an “observatory” – that tracks and studies university-community collaboration on provincial, national and international levels. Lafrenière is also passionate about working collaboratively within the university community. She is currently working with Laurier’s Diversity and Equity Office, Centre for Women in Science and Graduate Student Association to create a new, Laurier-specific training program for bystanders to address gendered violence. More informally, she works with less experienced colleagues to mentor them and help them secure grants. It’s part of her effort to model a different way of being a professor.